Reconstructive facial surgery for birth defects, trauma and cancer is a significant part of my public and private practice. This is useful experience when performing face lift surgery which uses similar principles and techniques. There is no universal “face lift”. Each patient has unique pattern of facial aging which requires precise anatomic diagnosis and individually appropriate surgery. Will I look natural after a face lift? 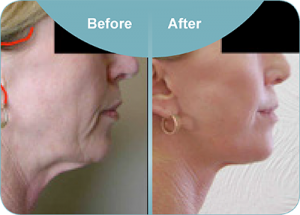 A face and neck lift addresses decent of the cheek fat fats, nasolabial folds, jowls, neck skin laxity and fatty accumulations beneath the chin. ”Face lift” is not a good description of the procedure I do which involves sculpting, repositioning tissues and volume filling. It is not just a tightening procedure. A natural appearance is the aim (rather than a “wind swept” face lifted look) and necessitates elevation and resuspension of the deep supporting structures of the face. It is critical that the tension is not transferred to the skin as the effect will be short lived. The SMAS (superficial musculo aponeurotic system), the fascia over the salivary glands, the malar pads and the platysma muscle are deep structures that are dissected free and sutured to various of parts of the facial skeleton. Global facial aging means that many face lift patients also benefit from concurrent surgery for the forehead and eyelids. Surgery to the nose and chin may also be performed concurrently. A face lift will turn back the clock significantly but does not stop ongoing aging. Some people may request a further face lift perhaps a decade later. Avoid smoking and excessive sun exposure which accelerates skin aging. Dr Davis may suggest a postoperative skin care regime depending on your skin type which may include retinoids and a good sunblock. Most face lifts are performed under general anaesthesia. Some short scar face lifts (including MACS lifts and S-lifts) may be performed under local anaesthetic with sedation if desired. Where are the scars placed? I often modify the incision around the hairline according to individual patterns. Dr Davis is happy to email a general information sheet that includes a diagram of the typical pattern used. A MACS face lift (minimal access cranial suspension) elevates facial tissues along a purely vertical vector and is most suitable for first time face lifts in which there is minimal mid neck laxity. Advantages include a shorter scar, less swelling and bruising, potentially daystay surgery under local anaesthetic and much lower complication rate than a traditional face lift. Disadvantages include uncomfortable chewing for the first four to five days (sutures are placed into the fibrous envelope of one of the chewing muscle). The method of plicating the SMAS layer may not last as long as a overlapping the SMAS layer and so I usually modify the technique rather than doing a true MACS lift. Genioplasty – repositioning the chin bone. After surgery the hair is shampooed and conditioned and dressings applied. What is the recovery after face lift surgery? Recovery depends on the extent of a face lift. After a minimally invasive lift, it may be possible to return to office jobs after one week. If a full SMAS face lift and eyelid surgery is also done three weeks is more sensible as the swelling is still noticeable. Strenuous exercise, gym work and heavy lifting should be avoided for at least three to four weeks. The first 24 hours are the most uncomfortable. The face is firmly bandaged beneath the chin, cold packs are placed over the eyes, there may be ointment in the eyes and sleeping is in a semi upright position. A dull ache is normal and is well controlled by oral analgesics. A sleeping tablet is offered. Sutures and possibly staples are sequentially removed over the following three to ten days. Smoking is strictly prohibited during healing. What are risks and complications of face lift surgery? Dr Davis will discuss risks in some detail during a consultation and the Australian Society of Plastic Surgeons brochure about face lift surgery is also available on request. Please email or phone if you would like a copy. There can be differences between the two sides (asymmetry). This is uncommon and usually minor. In most cases it was also present before the surgery.